The port town of Mangalore is one of the fastest growing cities of Karnataka and keeping in tune with the changes its landscape has undergone far-reaching transformation. This emerging cosmopolitan city has proved to be the perfect venue for the The Empire mall. Situated in the heart of the city on M G Road, Empire has emerged as the most happening place in the city, exemplifying the essence of what Mangalore stands for. 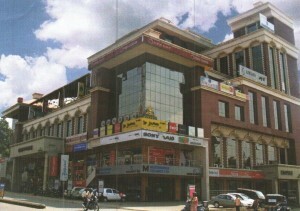 This nine-storied mall, a hallmark of Mohtisham, is the one-stop-destination for shopping, dining and entertainment for all age groups. Located amidst educational institutions, luxury shopping centers and business establishment it serves as the focal point around which major activities of the city are evolved. The Mall offers everything for everyone. For shopping aficionados it is a paradise par excellence as it houses supermarkets, antique stores, electronic showrooms, garment boutiques and book stores. It is a Gourmet’s delight as the fast food outlets, snack bars, multi-cuisine restaurants, chat centres and ice cream parlors offers a veritable variety of food to gratify the taste buds of food lovers. The entertainment zone at the mall offers fun-unlimited for all those who are on the lookout for some fun and frolic. The fun-park, cyber cafes, billiards/snooker centres, bowling alleys, video gaming centres and children’s amusement park will prove to be the perfect haven for all those who seek high-tech amusement. You can view the list of complete Stores and Shops in Empire Mall here.